This succulent Thai green curry recipe involves making your own curry paste. It's very simple and adds brilliant freshness of flavour. For the curry paste, lightly toast the coriander and cumin seeds in a dry frying pan, until fragrant. Place the seeds into a pestle and mortar, and add the shallot, chillies, garlic, ginger, lemongrass and salt. Pound to a paste with the pestle. Alternatively, you can use a food processor to do this. Cut the coriander stalks into chunks, and set aside the leaves for later. Add the coriander stalks and crumble the dried kaffir lime leaves to the mix, and continue to grind until fairly smooth. Add the fish sauce and a pinch of white pepper, to season. The curry paste is now ready to use. If not using immediately, the paste can be stored in a jar topped with a little oil and will keep in the fridge for a couple of weeks. For the curry, heat the vegetable oil in a wok or large frying pan over a medium heat. Add the chopped aubergines and fry for 4-5 minutes, until browned all over and starting to soften. Cook for another 10 minutes until the aubergines are golden-brown and softened. Add the solid fat from the top of the can of coconut milk and then add the Thai green curry paste and fry for 2-3 minutes until the paste has cooked a little and is fragrant. Add the remaining coconut milk, bring to the boil, then lower the heat to a simmer. Add the green beans and continue cooking for 2-3 minutes, stirring occasionally. Allow the coconut milk to reduce and thicken slightly before adding the chicken stock. Add the sugar and the fish sauce to the curry. Add the raw king prawns and cook for 3-5 minutes until they turn pink and are cooked through. Crumble in the crushed kaffir lime leaf, fresh lime juice and zest, and chopped coriander. 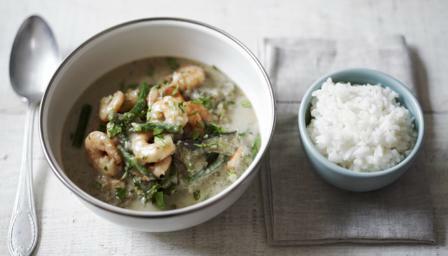 Serve with steamed jasmine rice, and sprinkle over the reserved coriander leaves.